A 10 day fully guided sew-along series to make the Conference Tote Bag. an elasticated full width split pocket for all your bits and pieces. The pattern and materials list is released on Day 1 and then you'll have a couple of days to prepare, cut your pattern and fabric, and get all of your materials together. Days 4 to 10 are our sewing days, and you can 'sew slow' doing a little each day or of course sew the whole bag at the end too. We have a sewing chat group where you can come and share your progress each day, ask for and receive advice and feedback and then share your completed projects at the end. It should be a lot of fun. The Sew Along starts officially on 9th August, but you can join us at any time. No pressure to keep things on schedule, sew on your own time. This pattern and class is on 'pay what you can afford' pricing. 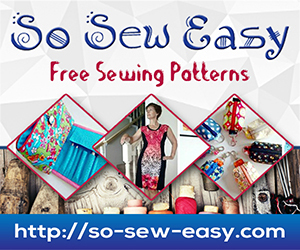 So Sew Easy has readers from all over the world and while $10 for a sewing pattern is affordable to many, in countries where wages and the cost of living are much lower, this is outside of what some can afford. I really do want everyone to take part, so to help out those on a budget there are a range of prices to pick from. Each option gives you access to the full class. Thank you for your understanding. Pick your price from the drop down box below.